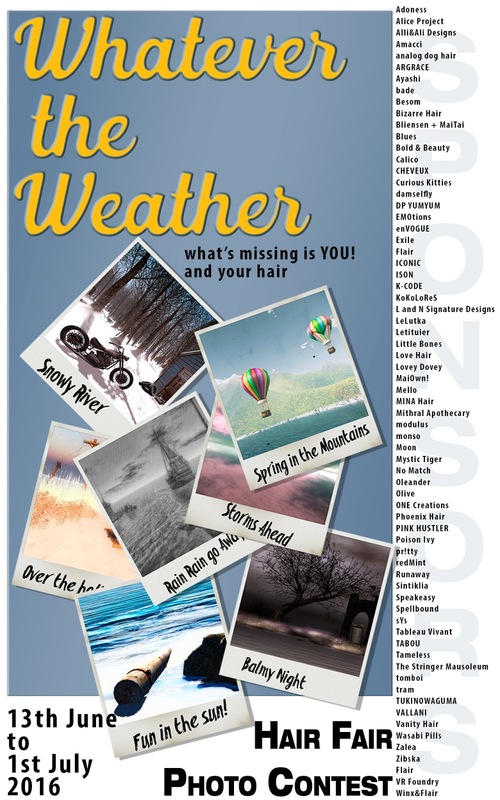 This years photo contest theme is ‘Whatever the Weather’. We want to see your use of fantastic hairstyles that show you having fun in the sun, coping with the rain, dealing with a storm, or joy at falling snow. However you can show off your great hairstyles and give them a weather type look is what we want to see. If the photos you submit are not what the committee feels are in theme, they will not be added to the pool. If your images are not in the pool they do not count against your five entries, so you can try again. If you are confused about the theme, or if your images are in the pool or not (please allow 24 hours for this as we are all on different timezones) then please contact Sasy Scarborough or Whimsy Winx. *The pictures in the poster are images from the Second Life Stock Images pool on Flickr, thank you to those that have submitted images there to use in this way. We did not include images of hair in our posters so as not to influence your entries.